This cobbler, casserole, whatever you want to call it is the new reason I could become a full time vegetarian again. All my leftover CSA vegetables went into this amazing summer meal creating something I wish I could enjoy all year long. Speaking of vegetarians, I’m taking my poor unsuspecting ex-cattle rancher husband to a “How to be a Vegetarian or Vegan” class tonight. Think he’ll suspect I’m being sneaky? If I had someone else on my team, I think I could do this. There’s also a very good chance he’ll run out screaming for his sanity. I’ll let you know what happens. A side salad and maybe a piece of garlic bread is all this cobbler needs. 1. In the bowl of a food processor, combine flour, salt, 1 teaspoon sugar, and cheese. Process until the cheese is mixed in. Add butter; process until mixture resembles coarse meal. 2. With machine running, pour ice water through feed tube. Pulse until dough holds together without becoming wet or sticky. Move dough to a bowl and press it into a ball. Cover with plastic wrap and place the bowl in the freezer while making the filling. 1. Melt remaining tablespoon butter in large skillet over medium heat. Add onion and garlic. Cook, stirring occasionally, until translucent and softened, 5 to 7 minutes. Transfer to a bowl to cool slightly. 2. Preheat the oven to 400 degrees. Set aside a 9x13 inch dish. Slice off the ends of the squash or zucchini and slice the long way to make two long pieces. Then slice each half into 1/3 inch thick half moons. Set aside. 3. In a large skillet over medium high heat melt the butter and warm the olive oil. Add the onion and ½ teaspoon salt. Sauté until softened, about 5 minutes. Add the garlic and cook for 30 seconds until fragrant. Add the squash and cook until the vegetables begin to brown, stirring occasionally. Place the mixture in the 9x13 inch dish. 4. Chop tomatoes into large bite size chunks and place in the dish. Add the chopped basil and sprinkle with lots of pepper, the sugar, flour and 2 teaspoons salt. Toss together. Add the half and half and toss again to combine. Spread the vegetables out evenly. 5. Remove the dough from the freezer. Pinch off cherry sized pieces and sprinkle over the vegetables. Bake for 45 to 50 minutes until the top is browned and the sides are bubbly. Wait 15 minutes until set and serve. A savory cobbler? What a great idea! And lol I hope you guys have fun at the course. Sounds wonderful Laura! I wish you luck at your class tonight. Dragging your husband along is sure to be exciting. Does he have any clues on what he's about to face? I can't wait to hear about the out come!! Mmmm i'm pretty sure this could turn me into a vegetarian also. Even though it doesn't really take much. Every time I eat summer's veggies I think I could give up meat forever! Good luck with the husband and the class! This looks like a dish that I would love...packed with goodness! Good luck tonight. I'm all about these vegetarian recipes, and I can't wait to hear about how your class went tonight. Your husband is a good man with an even better wife! I am enjoying my new eating challenge- and did a succotash tonight- this rocks, and love the name, you are so creative! I am very excited about this recipe. Thanks Laura! LOL--do you think you have a chance? Good luck with turning him veg! This cobbler looks like heaven to me. If I were married to you, I'd def go veg for meals like that. Hi Laura - this looks really good. My hubby would definitely leave that class screaming - are you considering going vegan? Boy does this ever look good. Wish I could get hubs to eat more veggies. this recipe just might do it. How wonderfully sneaky of you laura... i love the very idea! I love being as evil as you, and wonder if my hub would run screaming blue murder if I dragged him for one! I think a savoury and vegetarian cobbler is genius! WOW!! My husband would never attend the class, he actually wants to eat a cow every day. 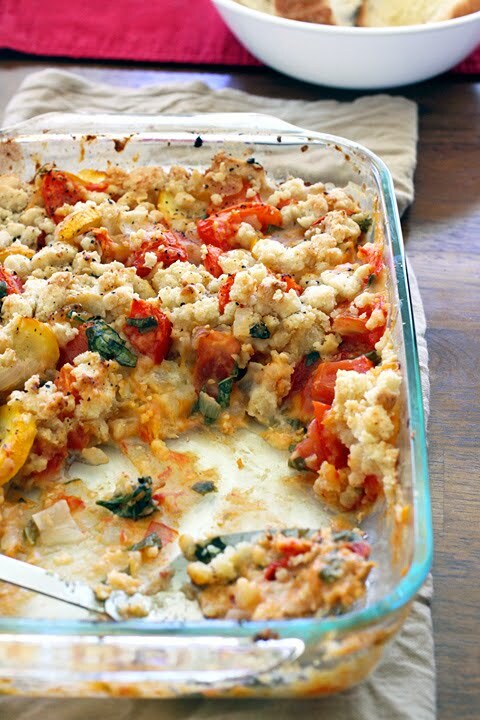 This vegetarian cobbler looks delicious. I need a veg side sish to go with dinner tonight, i might make a smaller version of this, it looks and sounds wonderful!